During the past few decades, a radical shift has occurred in how philosophers conceive of the relation between science and philosophy. A great number of analytic philosophers have adopted what is commonly called a ‘naturalistic’ approach, arguing that their inquiries ought to be in some sense continuous with science. Where early analytic philosophers often relied on a sharp distinction between science and philosophy—the former an empirical discipline concerned with fact, the latter an a priori discipline concerned with meaning—philosophers today largely follow Willard Van Orman Quine (1908-2000) in his seminal rejection of this distinction. This book offers a comprehensive study of Quine’s naturalism. Building on Quine’s published corpus as well as a thousands of unpublished letters, notes, lectures, papers, proposals, and annotations from the Quine archives, this book aims to reconstruct both the nature (chapters 2-4) and the development (chapter 5-7) of his naturalism. The appendix collects five previously unpublished notes, letters, and papers—documents which shed new light on Quine's revolutionary ideas about the relation between science and philosophy. B. F. Skinner and W. V. Quine, arguably the two most influential proponents of behaviorism in mid-twentieth century psychology and philosophy, are often considered to be brothers in arms. They were close friends, they had remarkably parallel careers, and they both identified as behaviorists. Yet, surprisingly little is known about the relation between the two. The question as to how the two influenced each other often comes up, but is standardly dealt with by rehearsing the few remarks on the issue in Skinner’s and Quine’s autobiographies. How did Skinner and Quine develop their varieties of behaviorism? In what ways did they affect each other? And how similar are their behaviorisms to begin with? In this paper, I shed new light on the relation between Skinner and Quine by infusing the debate with a wide range of new and previously unexamined evidence. Examining a large set of documents— correspondence, notes, datebooks, drafts, lectures, and teaching material—from the personal and academic archives of Skinner and Quine, I reconstruct (1) how they acquired their ‘behaviorisms’ in their student years, (2) how they developed their views in the first three decades of their careers, and (3) the ways in which they were influenced by the psychologists and philosophers of their time. W. V. Quine’s first philosophical monograph, Word and Object (1960), is widely recognized as one of the most influential books of twentieth century philosophy. Notes, letters, and draft manuscripts at the Quine Archives, however, reveal that Quine was already working on a philosophical book in the early 1940s; a project entitled Sign and Object. In this paper, I examine these and other unpublished documents and show that Sign and Object sheds new light on the evolution of Quine’s ideas. Where “Two Dogmas of Empiricism” is usually considered to be a turning point in Quine’s development, this paper redefines the place of ‘Two Dogmas’ in his oeuvre. Not only does Quine’s book project reveal that his views were already fairly naturalistic in the early 1940s (sections 3-5); Sign and Object also unearths the steps Quine had to take in maturing his perspective; steps that will be traced in the second half of this paper (sections 6-9). In: Sinclair, R. (ed.). Science and Sensibilia by W.V. Quine: The 1980 Immanuel Kant Lectures. Palgrave-Macmillan. One of the great values of the Immanuel Kant Lectures is that it sheds new light on the nature of Quine’s views about behaviorism. Where Quine’s linguistic behaviorism is well-known, the Lectures contain one of his most detailed discussions of behaviorism in psychology and the philosophy of mind. Quine clarifies the nature of his psychological commitments by arguing for a view that is quite modest: he argues against ‘excessively restrictive’ variants of behaviorism while maintaining that ‘a good measure of behaviorist discipline is still needed to keep [our mental] terms under control’. In this paper, I use Quine’s comments in the Lectures to reconstruct his position. I start by distinguishing three types of behaviorism in psychology and the philosophy of mind: ontological behaviorism, logical behaviorism, and epistemological behaviorism. Next, I reconstruct Quine’s perspective on each of these views and argue that he does not fully accept any of them. Finally, I combine these perspectives and reconstruct Quine’s surprisingly subtle view about behaviorism in psychology. Contemporary analytic philosophy is dominated by metaphilosophical naturalism, the view that philosophy ought to be continuous with science. This naturalistic turn is for a significant part due to the work of W. V. Quine. Yet, the development and the reception of Quine’s naturalism have never been systematically studied. In Verhaegh (2017; forthcoming), I reconstructed the early development of Quine’s naturalism (1930-1952). This paper continues this story and examines the development and the reception of Quine’s evolving naturalism after 1952. Scrutinizing a large set of unpublished notes, correspondence, drafts, papers, and lectures as well as published responses to Quine’s work, I show how both internal tensions and external criticisms forced him to continuously develop, rebrand, and refine his metaphilosophy before he explicitly decided to label his view ‘naturalism’ in the late 1960s. Journal of the History of Philosophy, 55:2, pp. 317-342. 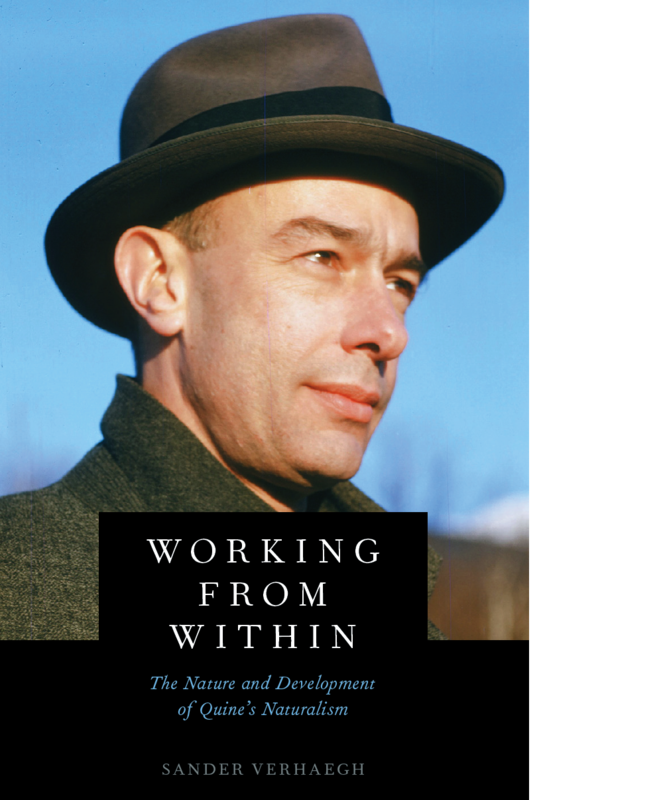 W. V. Quine is arguably the intellectual father of contemporary naturalism, the idea that there is no distinctively philosophical perspective on reality. Yet even though Quine has always been a science-minded philosopher, he did not adopt a fully naturalistic perspective until the early 1950s. In this paper, I reconstruct the genesis of Quine’s ideas on the relation between science and philosophy. Scrutinizing his unpublished papers and notebooks, I examine Quine’s development in the first decades of his career. After identifying three commitments supporting his naturalism---viz. empiricism, holism, and realism---I piece together the evolution of Quine’s position by examining the origins of these commitments one by one, showing how his early views gradually evolved into the mature naturalistic position that would have such an enormous impact on post-war analytic philosophy. Quine is routinely perceived as saving metaphysics from Carnapian positivism. Where Carnap rejects metaphysical existence claims as meaningless, Quine is taken to restore their intelligibility by dismantling the former’s internal-external distinction. The problem with this picture, however, is that it does not sit well with the fact that Quine, on many occasions, has argued that metaphysical existence claims ought to be dismissed. Setting aside the hypothesis that Quine’s metaphysical position is incoherent, one has to conclude that his views on metaphysics are subtler than is often presupposed; both the received view that Quine saved metaphysics and the opposite view that Carnap and Quine are on the same anti-metaphysical team seem too one-sided if we take seriously Quine’s own pronouncements on the issue. In this paper, I offer a detailed reconstruction of Quine’s perspective on metaphysical existence claims. Scrutinizing his published work as well as unpublished papers, letters, and notebooks, I show how Quine is able to both blur the boundary between scientific sense and metaphysical nonsense and to argue that we cannot ask what reality is really like in a distinctively philosophical way. I argue that although Quine’s position is much closer to Carnap’s than the received view suggests, it still differs in two crucial respects. The Southern Journal of Philosophy, 55:1, pp. 96-115. Quine’s metaphilosophical naturalism is often dismissed as overly ‘scientistic’. Many contemporary naturalists reject Quine’s idea that epistemology should become a “chapter of psychology” (1969a, 83) and urge for a more ‘liberal’, ‘pluralistic’ and/or ‘open minded’ naturalism instead. Still, whenever Quine explicitly reflects on the nature of his naturalism, he always insists that his position is modest and that he does not “think of philosophy as part of natural science” (1993, 10). Analyzing this tension, Susan Haack has argued that Quine’s naturalism contains a “deep-seated and significant ambivalence” (1993a, 353). In this paper, I argue that a more charitable interpretation is possible; a reading that does justice to Quine’s own pronouncements on the issue. I reconstruct Quine’s position and argue (i) that Haack and Quine, in their exchanges, have been talking past each other and (ii) that once this mutual misunderstanding is cleared up, Quine’s naturalism turns out to be more modest, and hence less scientistic, than many contemporary naturalists have presupposed. I show that Quine’s naturalism is first and foremost a rejection of the transcendental. It is only after adopting a broadly science-immanent perspective that Quine, in regimenting his language, starts making choices that many contemporary philosophers have argued to be unduly restrictive. Studies in History and Philosophy of Science, Part A, 61:1, pp. 11-20. Quine is routinely perceived as having changed his mind about the scope of the Duhem-Quine thesis, shifting from what has been called an ‘extreme holism’ to a more moderate view. Where the Quine of ‘Two Dogmas of Empiricism’ argues that “the unit of empirical significance is the whole of science” (1951, 42), the later Quine seems to back away from this “needlessly strong statement of holism” (1991, 393). In this paper, I show that the received view is incorrect. I distinguish three ways in which Quine’s early holism can be said to be wide-scoped and show that he has never changed his mind about any one of these aspects of his early view. Instead, I argue that Quine’s apparent change of mind can be explained away as a mere shift of emphasis. Dutch Title: Opschorting en onenigheid (with Pieter van der Kolk). Algemeen Nederlands Tijdschrift voor Wijsbegeerte, 108:1, pp. 37-52. Some sceptics claim that we ought suspend judgment whenever an epistemic peer disagrees. In this paper we argue that the sceptic’s conclusions are only correct in a limited number of scenarios. We show that sceptic’s conclusion is built on two premises---viz. the principle of evidential symmetry and the principle of evidentialism---and show that both premises are incorrect. First, we argue that peer disagreements are not symmetrical. Next, we show that even if one assumes that peer disagreements are symmetrical, it might still be rational to stick to one’s guns in the light of peer disagreement. Dutch Title: Een middenweg voor sciëntisme (with Pieter van der Kolk). Algemeen Nederlands Tijdschrift voor Wijsbegeerte, 107:3, pp. 285-299. Scientism, the view that only scientifically supported beliefs are epistemically justified, faces two influential problems: (1) scientism itself does not seem to be scientifically supported and hence self-referentially incoherent; and (2) scientism seems to dismiss many plausible commonsense beliefs as unjustified. In this paper, we show that both problems presuppose a needlessly narrow conception of science and argue that when scientism is based on a broader, more realistic conception of science, neither problem arises. Furthermore, we argue that our more moderate variant of scientism is still strong enough to have philosophical bite. Quine’s argument for a naturalized epistemology is routinely perceived as an argument from despair: traditional epistemology must be abandoned because all attempts to deduce our scientific theories from sense experience have failed. In this paper, I will show that this picture is historically inaccurate and that Quine’s argument against first philosophy is considerably stronger and subtler than the standard conception suggests. For Quine, the first philosopher’s quest for foundations is inherently incoherent; the very idea of a self-sufficient sense datum language is a mistake as there is no science-independent perspective from which to validate science. I will argue that a great deal of the confusion surrounding Quine’s argument is prompted by certain phrases in his seminal ‘Epistemology Naturalized’. Scrutinizing Quine’s work both before and after the latter paper provides a better key to understanding his remarkable views about the epistemological relation between theory and evidence. Australasian Journal of Philosophy, 91:4, pp. 771-784 (with Allard Tamminga). Quine’s holistic empiricist account of scientific inquiry can be characterized by three constitutive principles: noncontradiction, universal revisability and pragmatic ordering. We show that these constitutive principles cannot be regarded as statements within a holistic empiricist’s scientific theory of the world. This claim is a corollary of our refutation of Katz’s [1998, 2002] argument that holistic empiricism suffers from what he calls the Revisability Paradox. According to Katz, Quine’s empiricism is incoherent because its constitutive principles cannot themselves be rationally revised. Using Gärdenfors and Makinson’s logic of belief revision based on epistemic entrenchment, we argue that Katz wrongly assumes that the constitutive principles are statements within a holistic empiricist’s theory of the world. Instead, we show that constitutive principles are best seen as properties of a holistic empiricist’s theory of scientific inquiry and we submit that, without Katz’s mistaken assumption, the paradox cannot be formulated. We argue that our perspective on the status of constitutive principles is perfectly in line with Quinean orthodoxy. In conclusion, we compare our findings with van Fraassen’s  argument that we should think of empiricism as a stance, rather than as a doctrine. Metaphysics or Modernity? Editors: S. Baumgartner, T. Heisenberg, and S. Krebs. Bamberg: Bamberg University Press, pp. 249-269. Naturalists argue that metaphysics ought to be in some sense continuous with science. Putnam has claimed that if we push naturalism to its limits, we have to conclude with Quine that reference is indeterminate. Since Putnam believes Quine’s thesis to be utterly absurd, he regards naturalism to be an unsatisfactory approach to metaphysics. In this essay, I show that Quine’s ideas about reference do not necessarily follow from his naturalism and that, as a result, Putnam’s reductio argument against naturalism breaks down. In addition, I argue that Putnam’s pluralistic alternative to Quine’s views is perfectly compatible with a naturalistic perspective and that, in consequence, the relation between science and metaphysics is less straightforward than it might initially seem to be. Review: F. Janssen-Lauret and G. Kemp (2016, eds.). Quine and his Place in History. Review: Gary Ebbs (2017). Carnap, Quine, and Putnam on Methods of Inquiry. Quine’s Dissatisfaction with "Two Dogmas".